Half of the U.S. lives in these 146 counties - is yours one of them? Using publicly available Census data, Business Insider's Walter Hickey and Joe Weisenthal have deduced that over half of America's population is localized to a mere 146 of the 3,144 U.S. counties and county-equivalents. Of course, some counties contain way more people per square mile than others, and some counties are gargantuan, while others are small. At only around 13 square miles, Hawaii's Kalawao County is the smallest. San Bernardino County (the hugest, honking-est blue county in California in the map up top) is technically the largest county proper, with a land area of 20,052.5 square miles – but things get interesting if you include Alaska's boroughs and census areas, which serve as county equivalents for the purposes of the U.S. Census. In that case, the award for largest county unquestionably goes to the Yokon-Koyukuk Census Area, which has a land area of over 145,000 square miles. For a sense of scale, that's more than the total land area of Germany. These are all factors that affect what Hickey and Weisenthal were ultimately interested in: the total number of people per county. 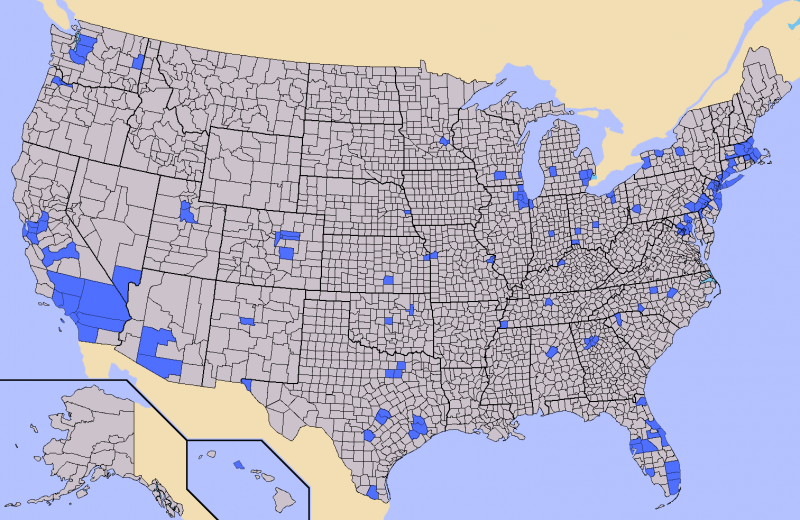 On a county-by-county basis that may not sound terribly interesting, but when you color in all 146 of them, the leftover regions turn out to be a stark sea of grey – a landmass that, collectively, sports a population density that is positively dwarfed by its blue-hued counterpart. Did your county make the list? Listed below is the full list of all 146. And just for fun, we've thrown in the 50 most densely populated counties in the U.S., along with the 50 least densely populated counties (remember: density is a different metric than total number). While we're on the subject, here's the Wikipedia page on U.S. county statistics. We'd be very curious to see an animation depicting how this population distribution has shifted over time, or a map that shades in the counties making up 60%, 75%, or 90% of the population; looking at this map, one can't help but wonder just how sparsely populated Rural America really is.